? Red Touch Yellow, Kills a Fellow. Red Touch Black, Friend of Jack. Red Touch Yellow, Kills a Fellow. Red Touch Black, Friend of Jack. 09.18.2008 - Many people have heard this rhyme for snake identification, even though very few people will ever encounter any of the snake species involved. For some reason, it's simply a popular rhyme, and people seem to remember the idea that there's some rhymey phrase out there to help distinguish between venomous snakes and safe ones. The snakes in question are the venomous Coral Snake, and a number of copycats, such as the Scarlet King Snake and the Florida Scarlet Snake. Oftentimes in nature, a species will mimic the appearance of a dangerous species, for protection. One such example is the Viceroy Butterfly, which looks very similar to a Monarch Butterfly. The Monarch is poisonous and tastes bad, so the Viceroys that look more like Monarchs don't get eaten, and thus the species evolved to look like the monarch. This is called Batesian Mimicry. The same goes for several snake species. Animals know to stay away from the venomous Coral Snake, so a similar color pattern has helped other snake species survive. Red touch yellow, kills a fellow. Red touch black, venom lack. Red touch yellow, death says hello. Black touch red, keep your head. Yellow touch red, you be dead. Red touch black, eat Cracker Jack. Red and yellow mingle, bite feel a tingle. Red and black hug, sing a song, you lug. Red and yellow cohabitate, soon you will suffocate. Red and black together, in for sunny weather. Red leans on yellow, legs turn to jell-o. Red leans on black, keep a strong back. Yellow brushes red, snake gets fed. Red brushes black, snake gets no snack. Snake of black and yellow and red, soon a stupid rhyme is said. I learned the rhyme in 7th grade from my biology teacher. He told me the original version by Jack Loticus. However, I've been involved in nuisance wildlife trapping and snake control for many years, and I have heard all of the above regional variations at one time or another. I suspect that even more exist. The great irony of these mnemonic devices for snake memory is that some people discover a snake, and during the time they take to carefully jog their memory for the correct rhyme, the snake has often bitten and slithered off, leaving the person standing with furrowed brow, his fate already sealed. 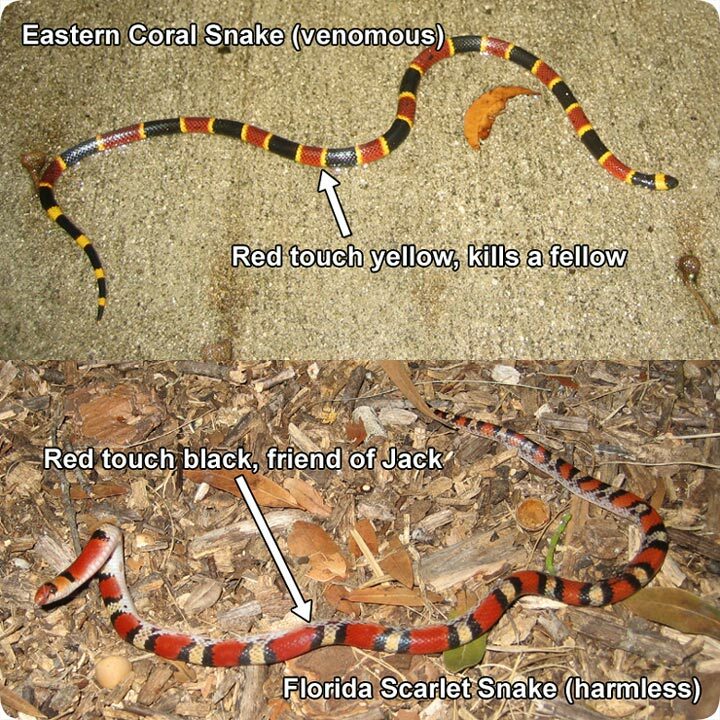 Of course, the ability to simply identify a snake on sight, without the use of silly rhymes, is a better approach, so just study the appearance of the Coral Snake seen above, and you'll recognize it if you see it. Many people also know to look for the black nose, which the mimic snakes lack. However, the real best approach when discovering an unknown snake is to simply leave it alone. Virtually all cases of snakebite occur when people attempt to capture or kill snakes. The Coral Snake in particular is very shy and reclusive, and it has no intention of biting. In fact, it has a tiny mouth and small fangs, and you have to be pretty careless to get envenomated. So I propose a new rhyme: "Just leave snakes alone, chappy, and everybody goes home happy".